Vancouver, Canada. October 23, 2018 – CanAlaska Uranium Ltd. (TSX-V: CVV; OTCQB: CVVUF; Frankfurt: DH7N), (“CanAlaska or the “Company”) reports that Cameco Corporation has given notice to acquire its 30% interest and form a Joint Venture on the West McArthur uranium project. CanAlaska will now become Operator of the Joint Venture. The Company is currently in the process of preparing a program of work for 2019 exploration. In August 2017 Cameco intersected the first high grade uranium mineralized intervals on the five kilometer long Grid 5 target area at the 36,000 hectare West McArthur uranium project. The West McArthur property commences 15 kilometres (9 miles) west of Cameco’s majority-owned McArthur River uranium mine, and is located close to existing mines and infrastructure. To date three holes have intersected mineralization, up to a maximum of 1.51% U3O8 over 5.5 metres. The main anomalous zone is centered on the structural complexity observed along the L5700W and L6000W geophysical lines, just west of the property boundary. Further information on the Project is available at www.canalaska.com. CanAlaska president Peter Dasler comments, “Cameco’s team has provided us with significant uranium mineralization on the C10 conductor within the West McArthur property, just 1 – 2 kilometres west of the Fox Lake uranium deposits which show inferred resources of approximately 68.1 million lbs based on 387,000 tonnes at 7.99% U3O8. In 2016 CanAlaska entered into an agreement with the De Beers Group of Companies to investigate magnetic anomalies within sandstones of the Western Athabasca. These magnetic anomalies showed as high amplitude circular magnetic features on a 2012 Saskatchewan-Federal Government airborne survey. De Beers embarked on an intensive work program, which included high resolution airborne magnetic surveying, and esker sampling for indicator minerals, and concluded with limited drill testing. De Beers work defined 695 magnetic targets, 123 of which were defined as “High Priority” for kimberlite. Eleven of the 695 targets were modeled as highly magnetic and very near-surface and on dry ground. Seven of these targets were drill tested with short holes, three of the targets were explained by the presence of highly magnetic organic-derived material at the top of glacial gravels. One target was partially explained by a small diabase sill, but the other targets were inconclusive. The esker sampling for indicator minerals was also inconclusive. De Beers and CanAlaska as well as other qualified experts have investigated the magnetic material from the drill holes, and concluded that it is probably biogenic, and formed from bacterial activity in an anaerobic environment. It is not detrital sand. Following the return of 100% of the project to CanAlaska, there has been continued modeling of kimberlite style targets, and discussion with experts. The Company has concluded that at least 40 of the 695 magnetic features have the discrete circular nature of classical kimberlite bodies and a different magnetic responses from the near-surface organic-derived material. In some cases these features are masked by near-surface magnetic responses. The Company is currently planning for drill testing of up to ten of these targets in late first quarter 2019. 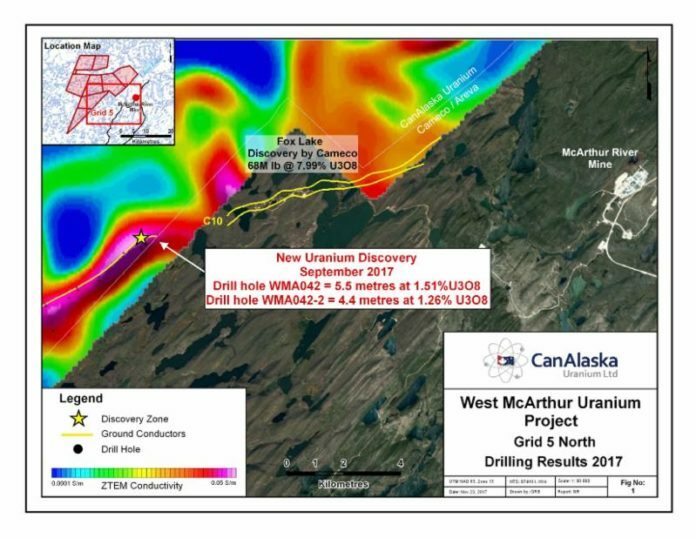 CanAlaska Uranium Ltd. (TSX-V: OTCQB: CVVUF; Frankfurt: DH7N) holds interests in approximately 152,000 hectares (375,000 acres), one of the largest land positions in Canada’s Athabasca Basin – the “Saudi Arabia of Uranium.” CanAlaska’s strategic holdings have attracted major international mining companies. CanAlaska is currently working with Cameco and Denison at two of the Company’s properties in the Eastern Athabasca Basin. CanAlaska is a project generator positioned for discovery success in the world’s richest uranium district. The Company also holds properties prospective for nickel, copper, gold and diamonds. For further information visit www.canalaska.com. All statements included in this press release that address activities, events or developments that the Company expects, believes or anticipates will or may occur in the future are forward-looking statements. In particular, this news release contains forward-looking information regarding the private placement offering and the use of proceeds of such offering. These forward-looking statements involve numerous assumptions made by the Company based on its experience, perception of historical trends, current conditions, expected future developments and other factors it believes are appropriate in the circumstances. These assumptions include, but are not limited to: future costs and expenses being based on historical costs and expenses, adjusted for inflation; and market demand for, and market acceptance of, the offering. In addition, these statements involve substantial known and unknown risks and uncertainties that contribute to the possibility that the predictions, forecasts, projections and other forward-looking statements will prove inaccurate, certain of which are beyond the Company’s control. Readers should not place undue reliance on forward-looking statements. Except as required by law, the Company does not intend to revise or update these forward-looking statements after the date hereof or revise them to reflect the occurrence of future unanticipated events. Previous articleNovo Integrated Sciences, Inc. Signs Binding LOI for Ownership in Cannabis Cultivator & Seller CannaPiece Group Inc.